Every era of the Star Wars saga has had its iconic villains, from the punk rock-looking Darth Maul, to the evil gentleman Count Dooku, and even the classic good guy/turned bad guy Darth Vader. In the newest adventure into the galaxy far, far away, we are introduced to Kylo Ren, who seems to have done his homework and taken some of the best characteristics of all the dark Jedi before him and become a true force of evil. He is wrapped in flowing robes and carries an unusual lightsaber like Darth Maul, his quiet sinister nature can seem very Dooku-y at times, and his mask and booming filtered voice give his victims chills just like Vader's did. Ren may not have the Separatists or the massive Galactic Empire behind him, but he's bound to cause a lot of damage at the front of the First Order forces before the new trilogy comes to a close. Complete Darth Vader's mission and fulfill your destiny with this Adult Deluxe Star Wars The Force Awakens Kylo Ren Costume! 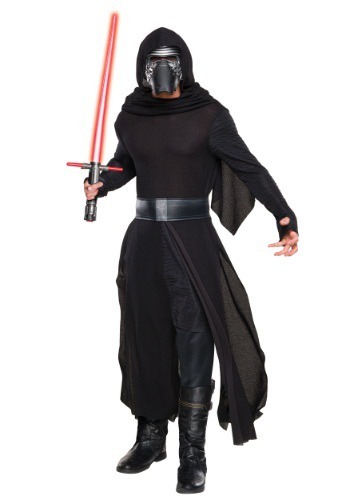 As an officially licensed Star Wars costume, the details and design of these black robes capture the look of Kylo Ren so you feel like the master of the Knights of Ren while scouring the galaxy for the last of the Jedi. The detachable mask and hood will be more than enough to intimidate those foolish enough to stand against you, but we recommend trying out your Kylo Ren impression in front of the mirror before using it in battle. You'll need to get it right! You'll also want to find a crackling, cross-guarded lightsaber to bring the fight to the pathetic Resistance and end the Republic once and for all!